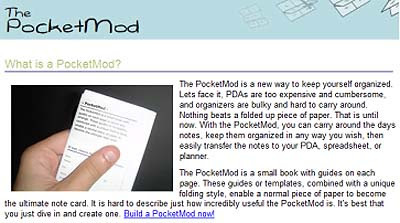 If you don’t have a fancy Pocket PC or organizer, dun fret ... With PocketMod, you don’t need one! So, what is a PocketMod? Believe it or not, but it’s not another electronic gadget. You actually just need a piece of paper and you can use it as a personal organizer. And best of all, it's completely customizable! Just follow the instructions on the website and you are all set to go! !